I really didn’t know much about the things to do in Minca Colombia when I arrived after a few days partying in Santa Marta. 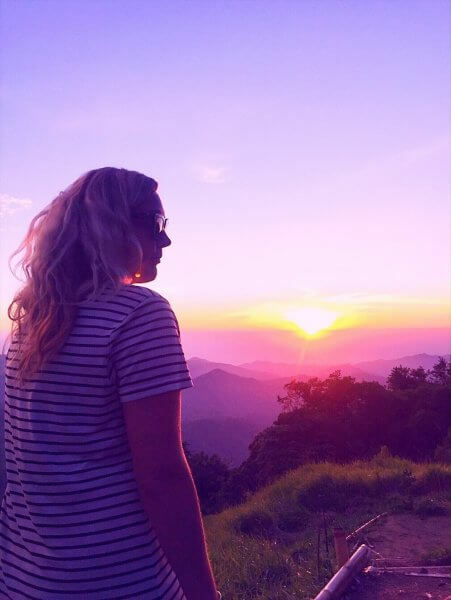 I had heard it was nice and one of the places to visit in Colombia, however, I don’t think I was really prepared for how much I was going to love the lush green hills, crazy moto drivers and epic sunsets. 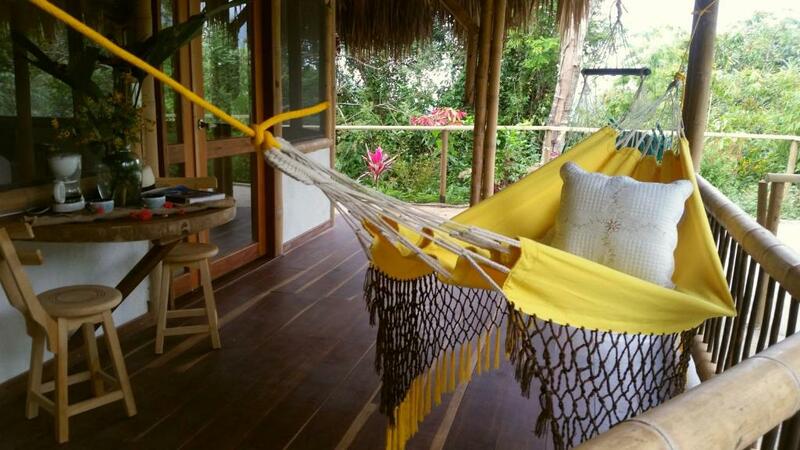 And while on the Gringo Trail everyone wants to stay at the Minca Hostel with the hammock – Casa Elemento. 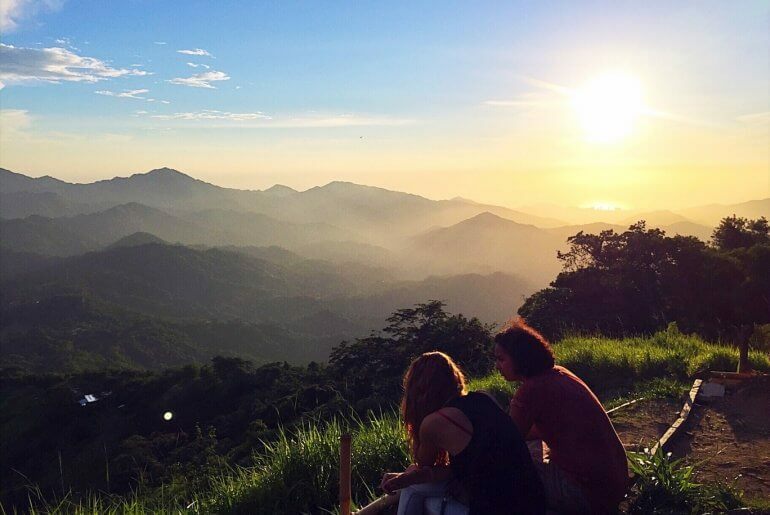 I took a different approach and avoided what I believe to be a tourist trap and stayed at the most incredible hostel – Mundo Nuevo Eco Lodge. Which lead to me having a totally different, totally chilled-out two weeks in Minca. So, if you’re heading to Minca Colombia to party this article might not be for you. 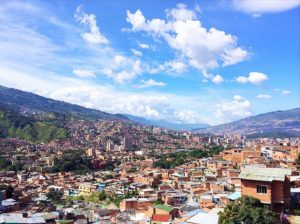 However, if you’re heading to Minca to chill post the pumping party scene of Santa Marta, then read on as here are the 7 best things to do in Minca Colombia to help you chill the eff out! If you’re wondering what to do in Minca then I’ve got a great answer for you… Absolutely nothing! The party scene in Colombia can be pretty hectic and there aren’t really many places to get away from it all. Minca is definitely one of those places. Plus with the Minca Colombia weather being pretty rainy and cloudy from about 11 am until 4 pm you’ve got the perfect excuse to go to bed early, get up early to do an activity or two and then chill out for the rest of the afternoon in a local cafe or playing board games at your hostel. Plus, I’m pretty sure Minca has one of the highest hammocks to people ratio I’ve seen in a long time. Of course, once you’re bored with relaxing there are a tonne of other great things to do in Minca Magdalena Colombia. The first of which is swimming in one of the nearby waterfalls. As Minca is located in lush rainforest there are a heap of them around. And as you’re in the North of Colombia the weather can get pretty steamy. The best waterfalls near Minca Colombia are as follows. Pozo Azul is a 45-minute walk from town, along Cienaga Minca Rd. It’s a pretty nice spot for a swim (even though the water is freezing!) but not the most amazing waterfall I’ve come across as it’s rather short. Also, try and avoid it on the weekend as it will be full of locals. The other waterfall near Minka is Miranka waterfall which is visually much more appealing as it’s much higher than Pozo Azul. Marinka Waterfalls are an hour uphill walk from town along ‘Cerro Kennedy Oriente’. And if you’re after an easier activity in Minca Colombia Las Piedras is your best option. These are some little rapids a 10-minute walk from town. The large white rocks that surround them are perfect for sunbaking and dipping in and out of the cool water. 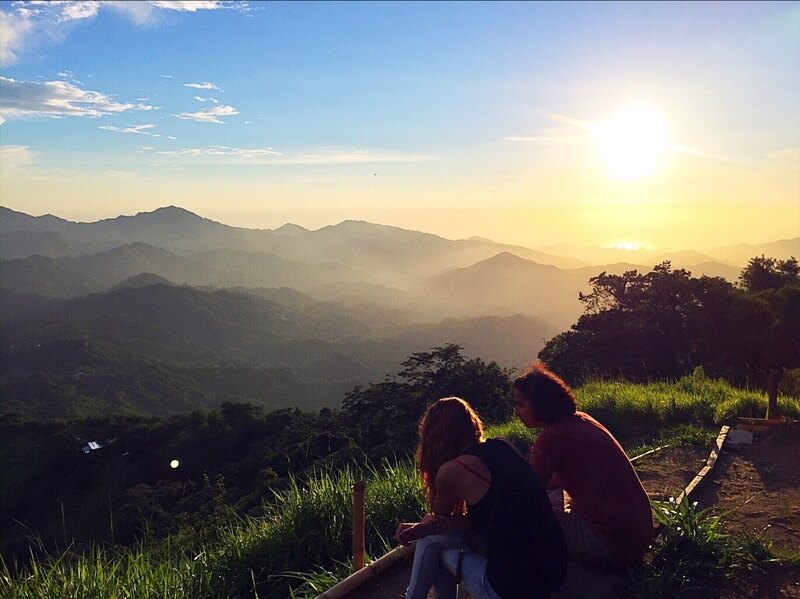 Watching the sunset was definitely one of my top things to do in Minca Colombia. I mean look at it! Hiking is definitely one of the top things to do in Minca Colombia. This is the view from El Mirador Minca. Los Pinos viewpoint lies high above Minca and is named after the 5 pine trees that surround it. It takes around 2 hours to hike here from the centre of town along ‘Cerro Kennedy Oriente’. The walk can be quite steep, so I suggest doing it earlier in the morning to avoid the sun. You can also camp here and watch as the two closest cities Santa Marta and Barranquilla light up overnight. Marinka Waterfalls are also on your way, a great excuse to stop for a break. This was one of my favourite things to do in Minca Colombia. 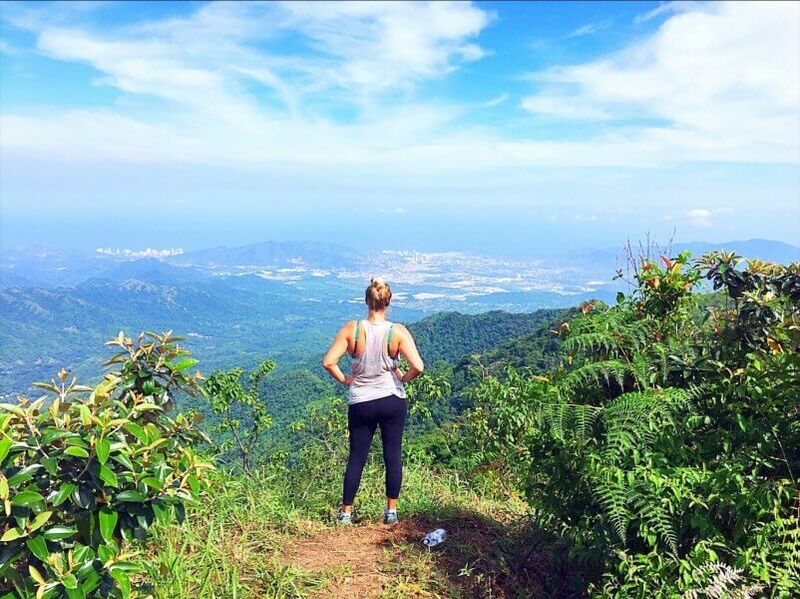 El Hike to El Mirador is another one of the best Minca attractions due to the incredible 360-degree views from the top. 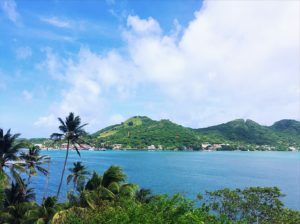 To get to El Mirador head towards Mundo Nuevo Eco Lodge on Antigua a Bonda. Once you see the hostel keep climbing the road past it for another 45 minutes until you see a little farm. Here you’ll see a sign to El Mirador to your left. Follow the path until you reach the top of the mountain. I’d recommend doing this hike early to avoid sun and cloud cover so you get the best views. 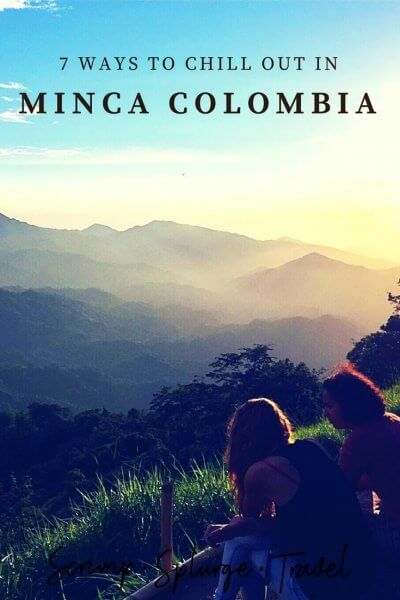 Wondering what to do in Minca Colombia? Finca La Candelaria Minca gives you an in-depth look at where chocolate comes from and is one of the best Minca activities. One of the top things to do in Minca Colombia is experience how the local produce is made. 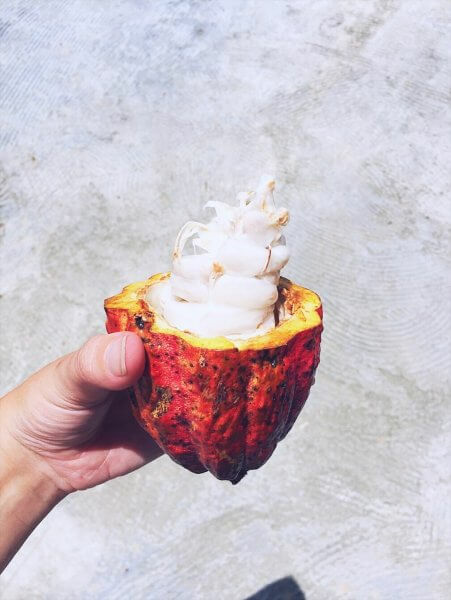 There are a number of farms producing cacao and coffee, both of which Colombia is known for. Most farms will offer tours and tastings and it’s a fabulous way to spend the day. I visited Finca La Candelaria Minca which is an awesome Cacao farm. We took the 1 hour guided tour which showed us around the farm and then a demonstration on how to make cacao, followed by a cacao tasting. Our guide was really knowledgeable, and the tour was quite fun and interactive. They’ve been growing cacao here for ages and have seen Minca change from the gorilla warzone it was 15 years ago into a flourishing tourist destination. Finca La Victoria coffee farm Minca is the best coffee farm in the area. And if you’re looking for a Minca coffee tour this is the place. The tours at both of these farms will cost you around 10,000 pesos (around $4 USD). Wondering where to eat in Minca Colombia? Well, The Lazy Cat Restaurant Minca has got you covered. Owned by a Colombian/English couple the food is just fantastic. Huge burgers, yummy noodles, delish smoothies, and pretty much everything comes with hummus! (which was amazing given I hadn’t been able to find any in Colombia). It’s one of the best places to eat in Minca Colombia if you’re in need of a touch of home. Every person you meet on the Gringo Trail in Colombia will be talking about the fact that one of the best things to do in Minca Colombia is visiting the amazing hostel with the giant hammock. But a word of warning the days when Casa Elemento Hostel Minca was one of the best places to stay in Minca Colombia seem to be over. Just to be up front, I didn’t stay there myself after being warned not to. But I met many people who had. Apparently, Casa Elemento Minca Colombia has been taken over by new owners in recent years and has completely changed vibes. And while yes the giant hammock is still there and still a great spot for a photo opp. I’d recommend heading here for the day and avoiding actually staying unless you want to listen to blaring techno music all afternoon/evening. Although if that’s your thing you should definitely go for it! Many of the best Minca hostels and Minca hotels are located up in the hills, taking advantage of the stunning views around them. It does, however, mean that you have to take a pretty scary moto ride to the top with your luggage. Therefore I recommend packing light if you can. It will make life much easier. Many of the hotels and hostels in Santa Marta also offer luggage storage for this reason. Anyway, without further ado, here are my picks for the best places to stay in Minca Colombia. Stunning Minca hostel high in the mountains surrounding the town. With vegetarian family dinners and the friendliest staff. Reserve in advance as it will book out. Running alongside the river in the middle of the jungle, this hostel has 2 outdoor pools and a garden. One of the best hostels in Minca. This stunning hotel is super peaceful and looks out over the Sierra Nevada. It has large rooms with a shared living room and cosy hammocks. If you’re after something a little different Glamping could be for you. With free breakfast and stunning tents overlooking the jungle, it’s one of the best Minca Colombia hotels. Minca is best accessed via Santa Marta and is a short 45-minute collectivo taxi journey. If you’re wondering how to get to Minca from Santa Marta there are a couple of options. The first is to take a private taxi. This should set you back around $20 USD and will take around 45 minutes. The most economical way of getting to Minca from Santa Marta is via one of the collectivos that leave on the corner of Calle 11 and Carrera 12 in the Santa Marta market. These cost around $3 USD per person. And leave every 20 – 30 minutes. Or as soon as the collectivo is full. Your final option (if you’ve packed light) is taking a moto-taxi. Which should cost between $3 – $4 USD. Once you arrive in Minca, you’ll most likely need to take the thrillingly steep ride up to your hotel on the back of a moto-taxi, which may cost around $7 USD. Yes, it’s hard to believe that this part of the journey costs more than actually getting there in most cases, but you’ll soon understand why once your driver is navigating the steep hills. From Cartagena and Baranquilla there are direct bus services daily with a number of bus companies. I ended up travelling with MarSol and found their service to be really good. The 4 – 5 hour trip from Cartagena to Minca in one of their airconditioned mini-buses will cost around $15 USD. They leave for Santa Marta pretty frequently every day and are rarely booked out. 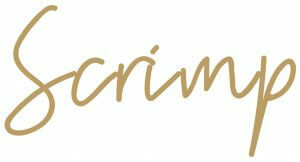 For info on trips and where their offices are you can message them directly on their Facebook page. When I took my trip with them I just turned up at the office and booked my ticket on the spot. As most of the things to do in Minca Colombia are completely free. Yippie! I was able to scrimp pretty much every day I was here spending around $25 – $30 USD per day. That’s $15 per night on accomodation and $10 – 15 for food and activities. Finished all the things to do in Minca Colombia and want more? Check these out! 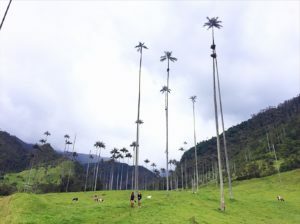 There are links within this post on the best things to do in Minca Colombia that I can earn a commission on, which allows me to keep providing free travel tips and destination guides. If you’re thinking about purchasing something I have recommended I’d really appreciate it if you bought it through this site. All opinions as always remain my own.